Trailhead and parking area are on Base Station Road in Chandler's Purchase, NH (the cascades are in Sargent's Purchase). Base Station Road (sign for the Cog Railway) leaves Rt. 302 4.4 miles east of Rt. 3. The large parking area is on the right, 5.5 miles up the road. 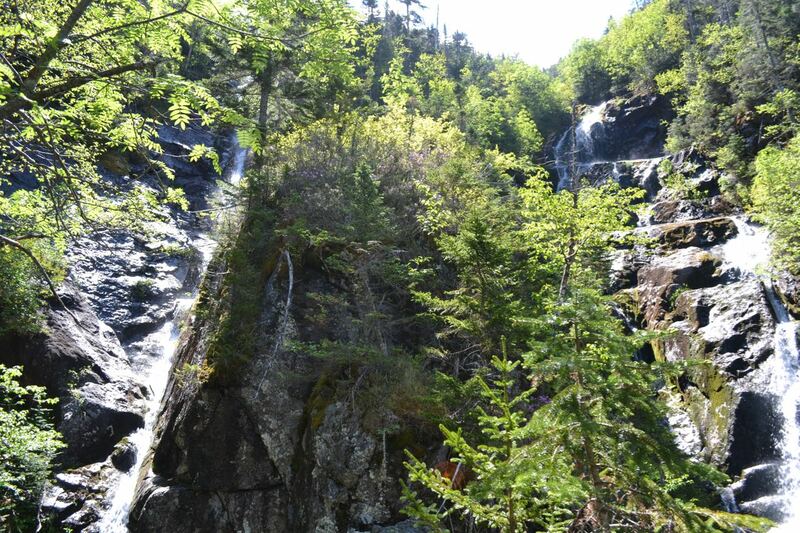 Unnamed, yet one of New Hampshire's most spectacular natural water features, the 100-foot cataracts on the Ammonoosuc Ravine Trail showcase the marvelous beauty of the headwaters of the Ammonoosuc River. Along the wild river walk, you'll see more delightful sights, including the Gem Pool, a green-tinted pool of water into which pours a pretty cascade. For the full hike on the Ammonoosuc Ravine Trail, see Mt. Washington. Leave the far left side of the parking area and head out at easy grades on the pretty, fern-lined Ammonoosuc Ravine Trail. In 0.3 miles, the trail bends to the left and drops to cross Franklin Brook. It then swings back to the right as it continues its easy meander through the lush forest. After 0.7 miles more, a path to the Cog Railway Base Station enters on the left as you approaches the Ammonoosuc River. You are greeted by the rush of foamy white cascades. Continuing on, the trail closely follows the river for most of its length. There are many places to step out to the river and enjoy its remote aura. Soon, the trail passes a plaque honoring one of the many deaths which have occurred on Mt. Washington. As you venture further along the river, look up at the hillside to glimpse the cascades which mark the end of your hike. Climbing soon becomes rougher, and after passing an open area in the river, the trail heads to the left to cross Monroe Brook after 0.7 miles along the river. In another 0.3 miles, the trail crosses a log bridge over a precarious drop into the river and soon reaches the Gem Pool. There is a good view of the Gem Pool's cascade from here, but you may have to move around to be at the right angle to see its green color. After crossing the river (at the outlet of the pool), the trail begins a very steep and rocky climb. Continue climbing on the relentlessly steep trail for 0.2 more miles, then turn right onto an obvious side path, which descends to a rock ledge high above another green pool in the river. Two enormous waterfalls, separated by a rock wall which blooms with rhodora in the spring, plunge down narrow chutes and join forces in the pool below. The south waterfall is the more impressive of the two, as it is the one on the main branch of the river. This waterfall splits up on its way down and forms numerous fanning drops. The one on the north side, while smaller, is also very impressive. It flows down at an angle along the rock wall dividing the two. You will find it difficult to leave these captivating cascades.